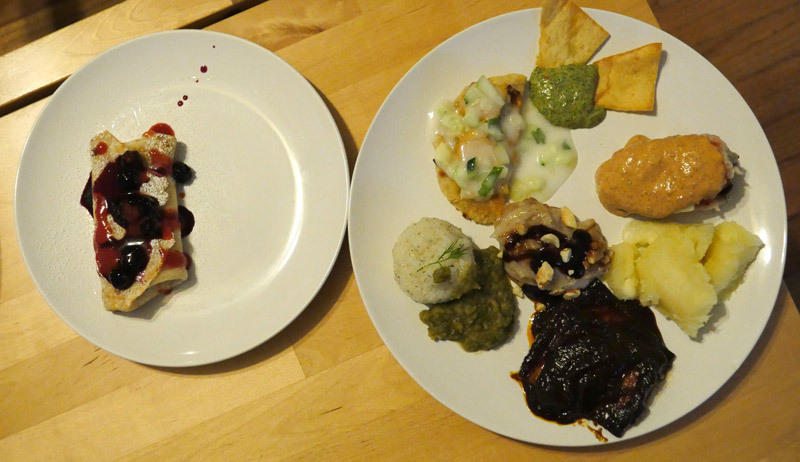 The theme for Vegan Bake Club meeting #31 was sauces. 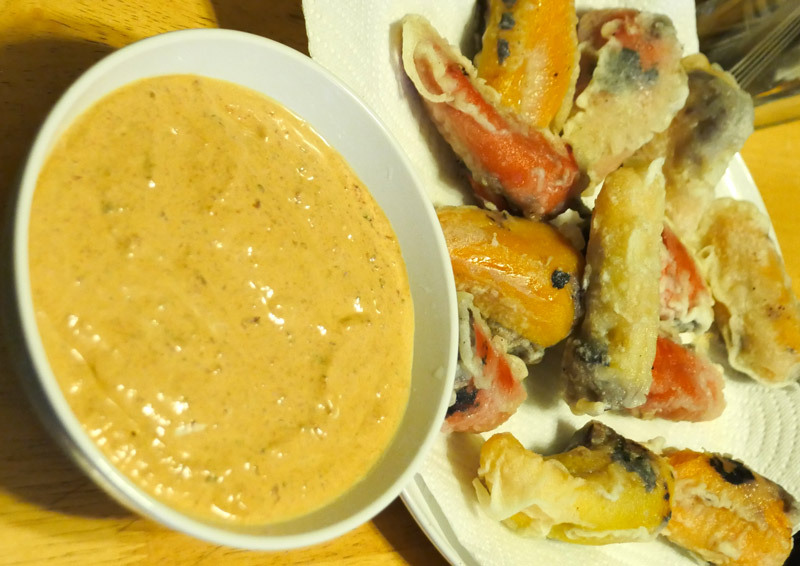 It kind of tricked people into making two things, sauce plus something for it to go on. 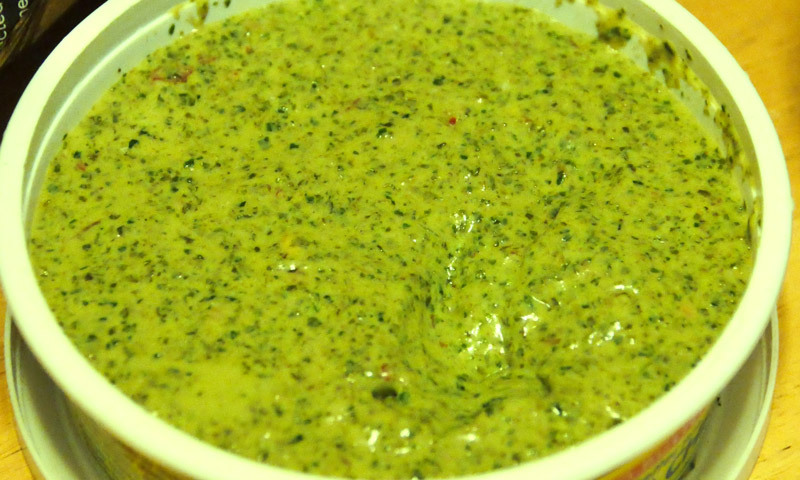 Often cooking with an Indian food inspiration, Billy prepared a mint chutney for the sauces theme. He pureed fresh mint, basil (home grown), cilantro (home grown), Tofutti Brand Non-Hydrogenated Better Than Cream Cheese, black salt, and lemon juice. To serve with his mint chutney, Billy attempted to make papadum. Now referred to as “Not Papadum” because it did not actually turn out edible and thus did not attend the VBC meeting, the attempted wafer was made with ground lentils, water, black pepper, salt, and baking soda. Upon realizing the Not Papadum was not fit for general consumption, the mint chutney was served with store-bought pita chips. Sarah and John (not the meeting host John, but a new John to VBC!) worked in tandem to serve a vegan yogurt sauce with a tempeh naan. 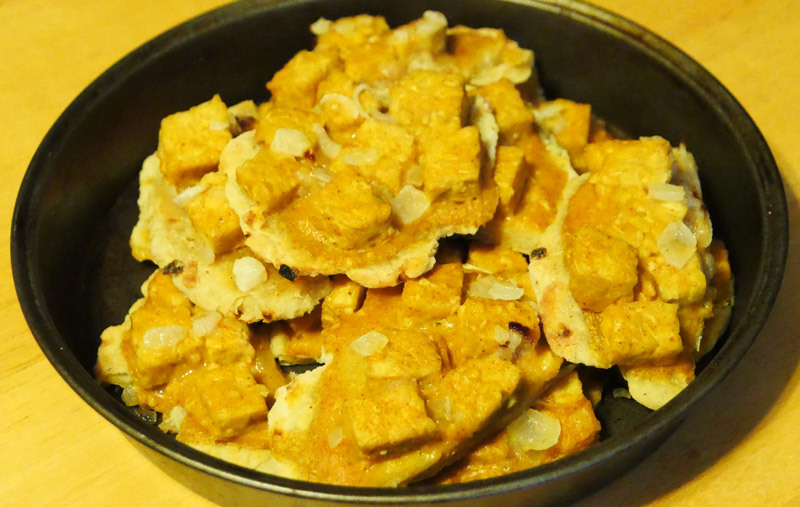 John made a garlic and onion naan topped with tempeh marinated in a coriander, paprika, garlic yogurt sauce. 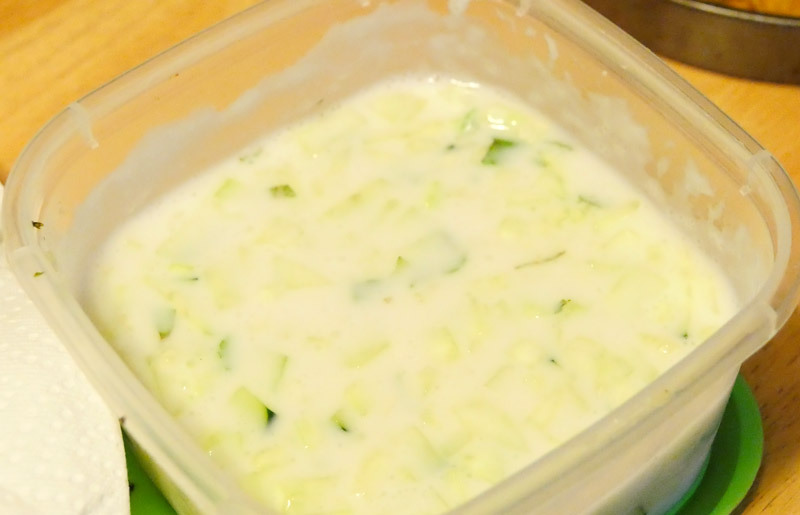 Sarah’s yogurt sauce included the fresh flavors of cucumber, mint, and lemon. Slynn made barbecue sauce from scratch with food processed onion and garlic, thyme, mustard powder, cumin, pomegranate molasses, and ketchup. She then baked it with tofu per the Veganomicon BBQ Tofu recipe. Our host John went way beyond sauce for his dish. 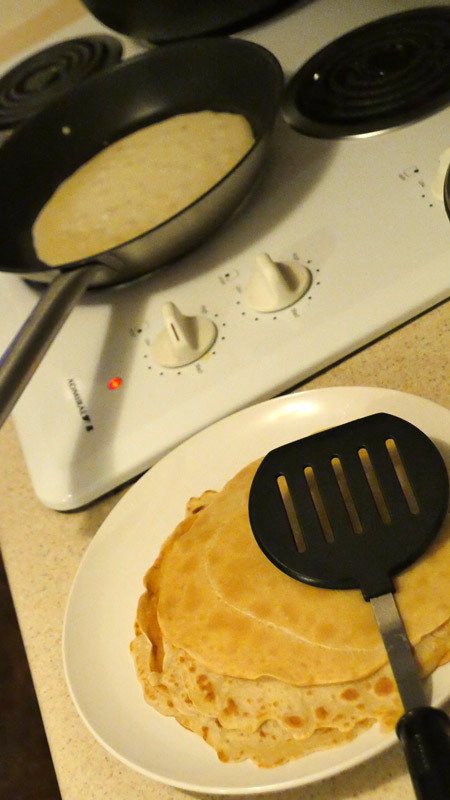 He made blintzes packed with a cheezy creamy filling concocted from a blend of silken and firm tofu, vegan cream cheese, lemon zest, vanilla, almond extract, and powdered sugar. 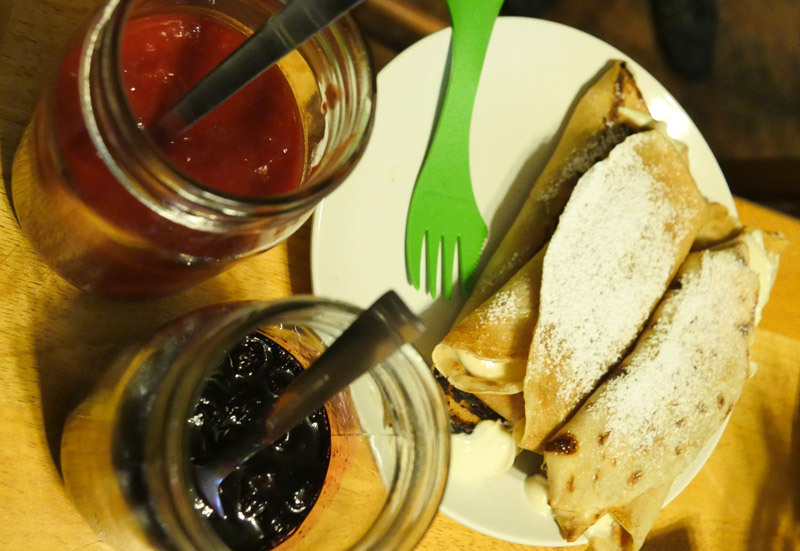 He made a strawberry orange sauce (it tasted just like gummy bears in a very pleasing way) that contained a whole blended orange and a second sauce made with blueberries and lemon zest. 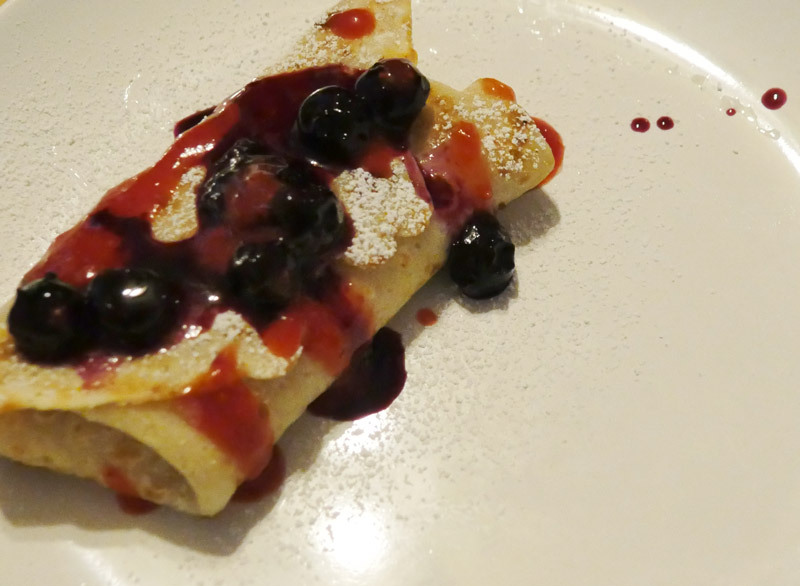 He sprinkled the finished blintzes with powdered sugar as pretty as a first snow dusting of the year. 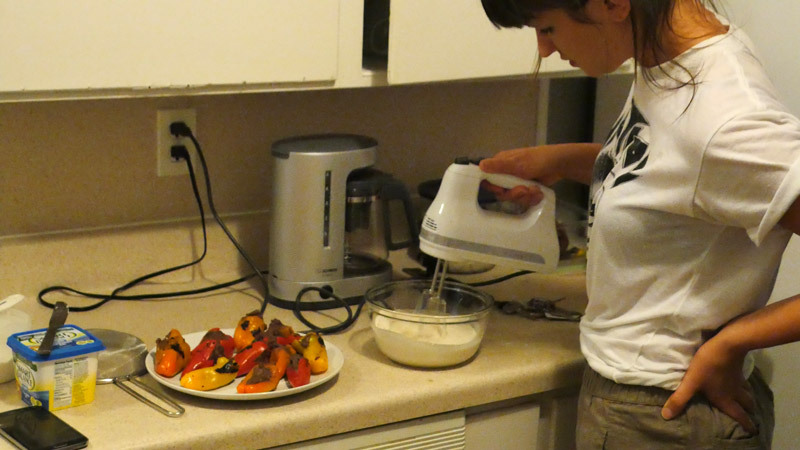 Taylor showed off her abundant culinary skills with a vegan rendition of chiles rellenos. 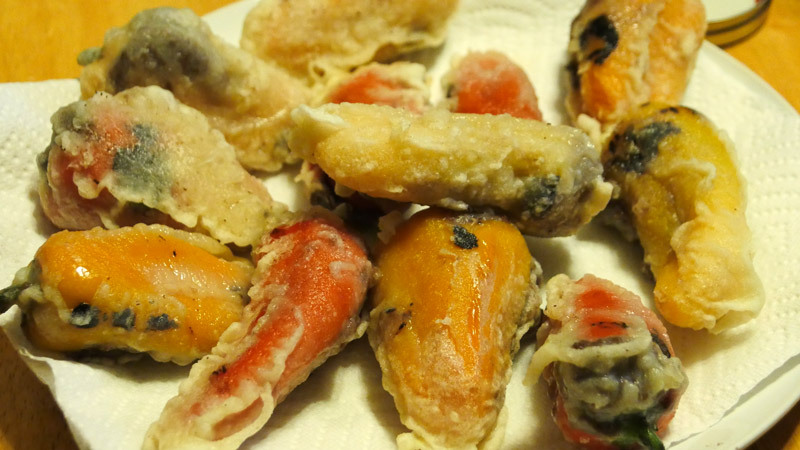 She filled colorful little peppers with refried black beans, battered them in a flour, water, baking powder, salt blend, and deep fried them. 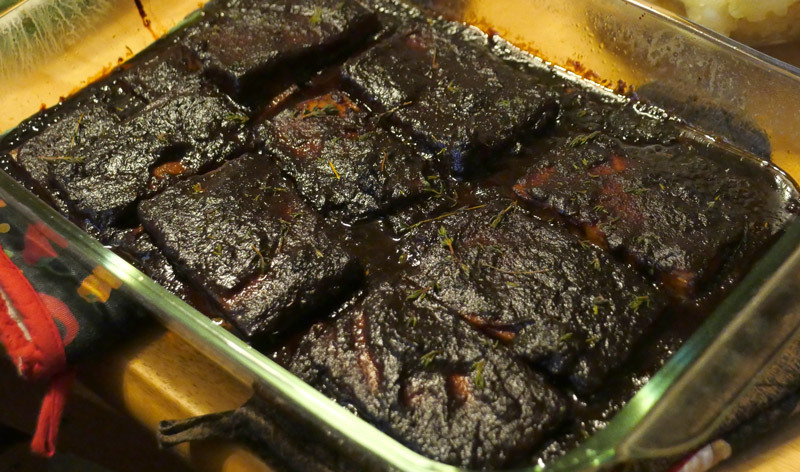 She prepared a sauce to accompany them from vegan cream cheese, a can of chipotle peppers, garlic, and lemon. 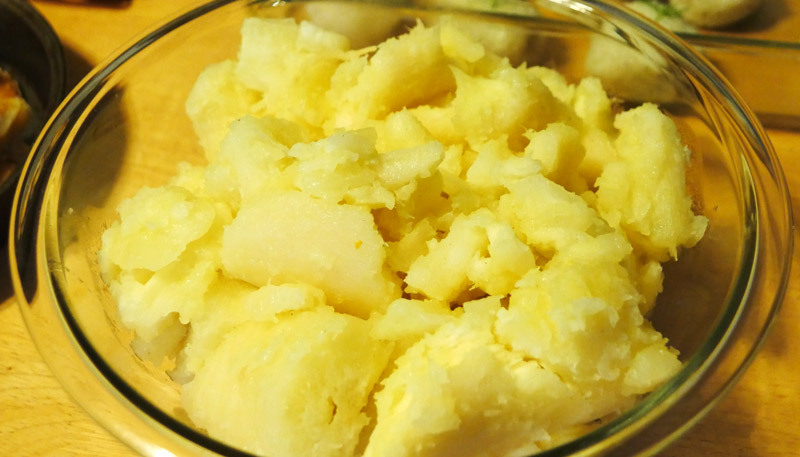 Brenda and Victor made Yuca con Mojo (yucca with garlic sauce), a dish popular in Cuba. They used frozen yucca for easier preparation, boiling it then combining it with a sauce containing garlic, lime, olive oil, oregano, and salt. Lilly made boiled split peas seasoned with dried dill and salt. After a long time cooking, she added fresh dill for a final touch. She prepared the rice in a rice cooker so that it would turn out sticky. 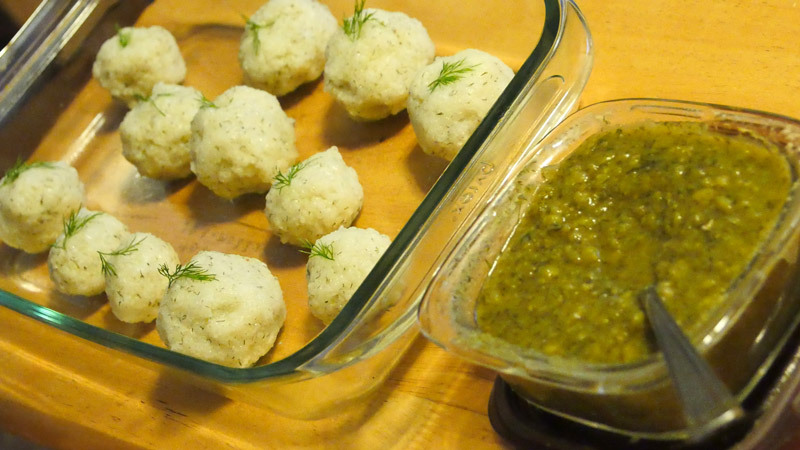 She added dried dill and Earth Balance to the rice before forming it into balls for serving. Lauren decided to make this Persian pudding with pomegranate molasses after having if for the first time during a visit to India Joze in Santa Cruz, California. She made the pudding with almond milk, toasted almond, rose water (6 tablepoons! 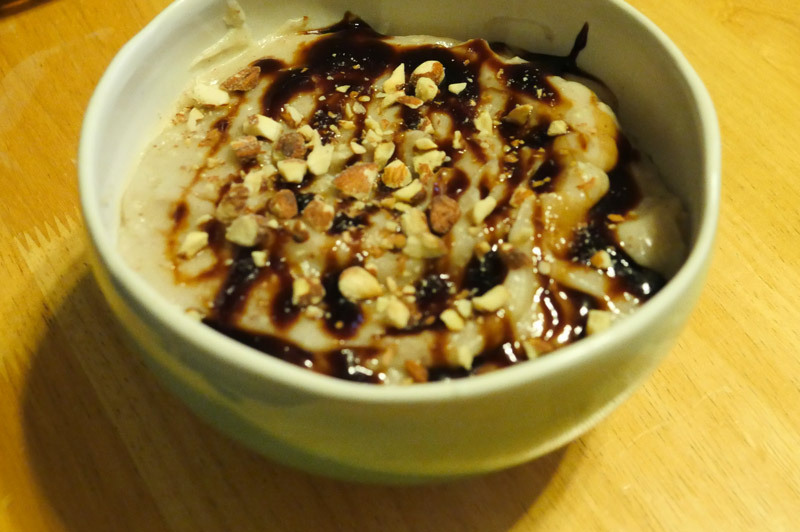 ), and ground cardamom then topped it off with chopped almonds and homemade pomegranate molasses. 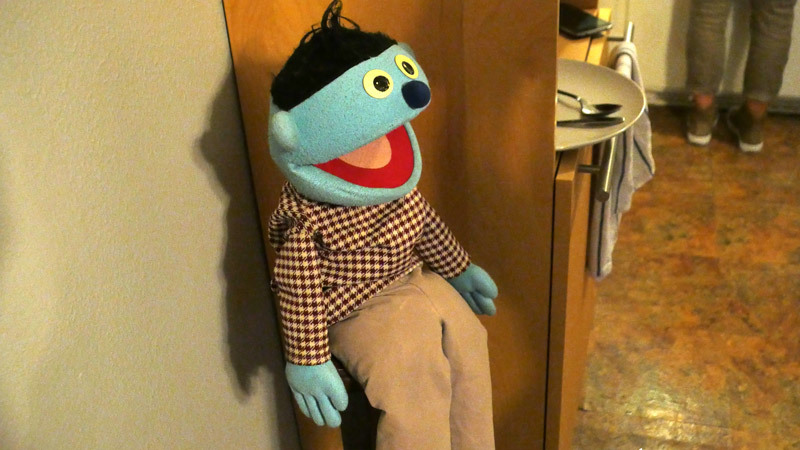 Here is John’s pet kitchen puppet. One Response to "September 20, 2015 – Sauces"